We don't often cover mobile games around these parts, for obvious reasons, but today we shall make an exception. For today, Blizzard has announced that the strategy/card game Hearthstone is finally available on iPhones and Android mobiles. 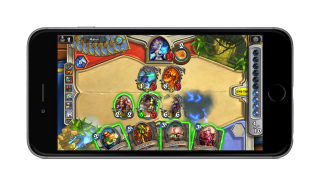 "We're excited to welcome mobile gamers to the Hearthstone community," Blizzard boss Mike Morhaime said. "Hearthstone's quick, super-accessible gameplay is perfect for gaming on the go, and with the mobile versions it's incredibly easy to jump into a match and have some fun." The mobile edition of Hearthstone will feature a new interface designed for small screens, but players will still have full access to their existing decks when they sign in, and it will offer all the same features and content as the PC and tablet versions of the game. To celebrate the mobile launch, players who complete one game of Hearthstone on their phone in any mode, win or lose, will be given a free Classic card pack from the original Hearthstone deck. The iOS version of Hearthstone is available from the iTunes App Store, while the Android release can be found at Google Play and Amazon. Update: The mobile version of Hearthstone rolled out this afternoon but may not show up in searches just yet: The iOS version appears fully live, but it looks like Google Play is still reporting as for tablets only. Keep trying!